These things are so cute & really great use of old Christmas cake decorations & jars. They are also a GREAT way to keep little brothers entertained - or even for doing with older kids....they are lots of fun. Plus you can use anything, as you can see, for the figure in the middle. 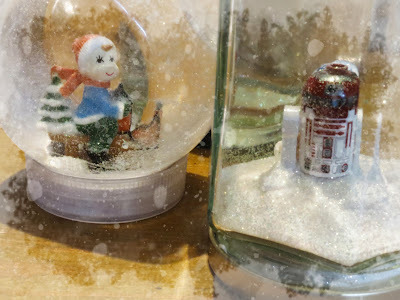 One of these is a lego mini figure for the snow globe that's going to be my brother's Christmas present from my foster brother. The way they were done in primary school included play-dough which I totally don't recommend....apparently play-dough is now water soluble & my first attempt at this dissolved. Maybe try salt dough? This is really basic, place a lump of Newplast onto the lid of the jar until the desired height has been achieved - remembering to leave space around the edge so that the lid can be fastened. Then squish a figure into the clay & secure in place a little clay around the edges. 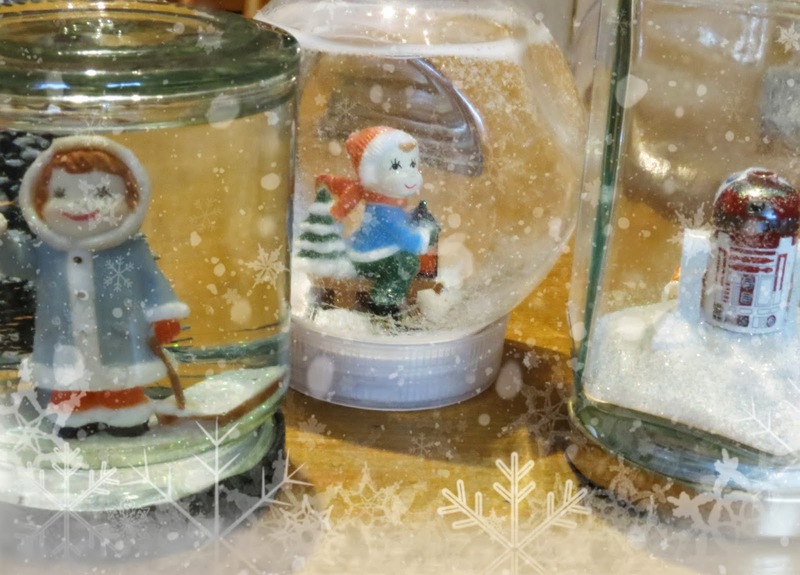 Fill the jar with water until nearly the top & tip in a suitable quantity of white or silver glitter (only you know how much you need) & carefully screw the lid onto the jar. Then sit it on the lid & tada! If you are looking for a jar specifically for this I recommend the ones that had the buttons in from the button wreath post, they are plastic & so kid safe....plus they are kind of round so they fit in with the whole 'snow globe' thing. these look so cute...I have some very pretty cake decorations and feel snow globes would be good use for them.. It also gives me the perfect excuse not to have to decorate a cake! A total win/win !! Thanks for all the craft and food ideas for Christmas I love them all.